Having read mixed reviews of Windsor Design chisels from Harbor Freight, I decided to check them out for myself, and I’m very glad I did. As most of the reviews were dated, some going back as far as 2012, I do believe the Windsor Design folks have taken notice. For the unbelievably low price of $9.99, the six-piece set #62641 is quite remarkable. Out of the package the grinding was somewhat rough, but like all new chisels they need sharpening. The handles seemed fine to me, hefty and very comfortable. I may have lucked out there, as I do remember looking through several packages before making my final selection. 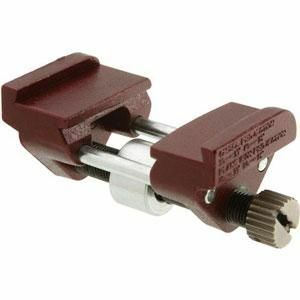 The set consists of the following sizes: 1/4”, 1/2”, 3/4”, 1” 1-1/4”, and 1-1/2”. 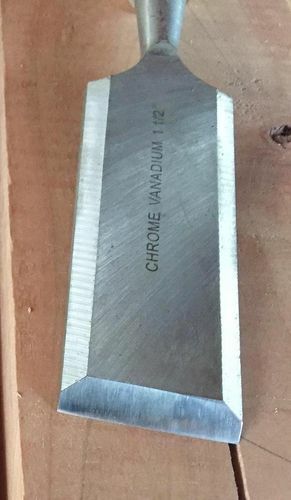 I started the sharpening process with the 1-1/2” chisel, assuming it would take the longest. Surprisingly the back took but 15 minutes to flatten on a 180 grit diamond plate. I completely changed the bevel from 30° to 25°, so this process took a bit longer. After just 45 minutes of working across my sharpening station from 180 to 260 to 360 diamond plates, I spent another 10 minutes on 800 grit wet/dry sandpaper. Then with just a few strokes on the strop I had a pretty decent edge. The remaining chisels took much less time. The back of the 3/4” chisel was almost completely flat right out of the package! I must say I am very pleased with this set of chisels. To date I have used them on cherry, maple, yellow pine, and sycamore, and they have kept an edge. Now, I realize that I may have lucked out and picked up a set manufactured way before quittin’ time on a Friday, but this set cannot be beaten for the price! So why not try your luck, too! Interesting,it’s hard to believe HF or anyone can make and sell chisels for $10 that would be worth having, thanks for your review. Thanks, Jim. I’m sure you remember the Aldi chisel craze a few years back. I have a set of those as well and they pale in comparison to this “new” Windsor Design set. I’m sure as the word gets out they will not be $9.99 for long. I may have to check those out this weekend. It’s the big sidewalk sale weekend!! Harbor Freight is far from as bad as some make it out to be. They have some very good stuff if you have an eye for quality and a desire for thrift. The very best saw blade I have ever had in 60 years of woodworking is a Harbor Freight blade. A couple of years I brought a nice Hammer K-3 sliding table saw into my shop. It uses a 12” saw blade and my old saw was a 10” so I have plenty of 10” blades and intended to use those. However, one day I was in Harbor Freight and spotted their rack of table saw blades. Thinking it might be handy to have a 12” blade available should I ever need it, I bought one with 96 carbide teeth for $36. The Hammer saw has an electronic brake to quickly slow the blade down when you cut the saw off. To prevent the blade from unscrewing, they have two pins near the arbor hole to keep the blade from unscrewing as above. So I sent the blade off to Forrest Blades in New Jersey to resize the arbor hole and punch the two pin holes which cost about $35. When I got the blade back, I tried it out on the saw. It cut so smooth and ran so true that I never took it off. Best blade I ever had! I may have to check those out this weekend. It s the big sidewalk sale weekend!! Scott, I hope you do. Take the time to compare packages, looking closely at the handles. If you do buy a set, please check back here and let us know what you think. Good luck! I have been using HF chisels for about two years now. My only compliant is that they need to be sharpened more frequently than I would like. However I do not have any basis to judge as these are the only chisels I own. My set the blades are perhaps shorter than some other brands. I can’t really fit them into one of the edge clamping honing jigs. But I have a Worksharp so I use the chisel sharpening port. I have been using HF chisels for about two years now. My only compliant is that they need to be sharpened more frequently than I would like. However I do not have any basis to judge as these are the only chisels I own. My set the blades are perhaps shorter than some other brands. I can t really fit them into one of the edge clamping honing jigs. But I have a Worksharp so I use the chisel sharpening port. ... found here @ Highland Working for $10.99 … works like a charm! With this in mind, we are generally happy when something works just slightly more than acceptable. Still, I would never compare my $20.00 trim router to a Bosch Colt. Heck, I don’t WANT to compare because I don’t want to know what I’m missing. Same is true with these chisels. They work well enough, and until they are compared to something with a higher standard of quality, we will happily work with them, assuming they are great because our expectations are only half set. Still, I will continue to shop are HF. Regardless of what I said above, I love the place. My first set were HF. Can’t beat them for 10$. It’s not Sheffield steel but they’re 10$. I buy them to make turning tools with different profiles. For me HF really draws a line under the buyer beware and read the reviews. I like HF for the ‘will use once a year’ tools that I need. The key I found is to really carefully go through the reviews and look for slightly different versions of the same product. I bought a big hammer drill from there a while back and they had a red version and a maroon version, almost exactly the same specs and within 10% in price. One had terrible reviews and the other had good reviews. Bought the good review one and have probably put 100 hours of splitting thin slab and drilling holes for rebar with no issues other than the need to keep it well greased. I’ve seen this a number of times. One guy buys the light blue widget and it falls apart, guy 2 buys the dark blue widget and is happy for a long time. Mike – I also think a lot has to do with the individual wielding the tool. Do you remember the Yugo? Within nine months of their introduction junk yards across the country were inundated with those cheap little cars. I proudly admit being a Yugo owner. I bought mine in 1987, and unlike most I drove the little thing until 1996. Knowing that it was a cheap little car, I treated it as such. So, as long as you take your time and maintain the proper level of grease, I’m sure you’ll get several hundred more hours out of your big hammer drill. I’m pretty new to fine woodworking (lots of home improvement woodworking in my past, but nothing that required a fine-edged chisel). I’m trying to outfit a shop on a budget, so I picked these up when I saw them at Harbor Freight. They’ll work fine…but it’s taken a long time to get them there. (I should note that I’m a little OCD about tools; my finish standard for a blade is “can I see a clear reflection of my eye?”, i.e. mirror finish.) When my DMT Coarse plate (DuoSharp Coarse-Fine combo) was taking forever to flatten the chisel backs, I broke down and bought a XXCoarse DMT plate. It certainly removes steel faster but when I used it on the bevel I had a heck of a time not gouging the edge. It was as though the XXCoarse plate was digging gouges into the edge. Once I had the 25-degree angle I wanted I switched back to the standard Coarse but it took so long to get the edge gougeless, I wondered if it would have taken the same amount of time with just the standard Coarse plate. Sorry to go on so long. Bottom line is the chisels will work fine, but be prepared to take a good amount of time getting them to working condition. Of course, HF quality control will mean some chisels will be better/worse than others, so YMMV. Hopefully I got a bad batch and yours will be easier. I have two sets of chisels, one is a hardware store ‘scruffty’ set that I use for most anything … Then I have a nice Sheffield set that live in a cabinet and are for the finer work. It amazes me how often I have to re-sharpen the Hardware set compared to the Sheffield set. Harbor Freight has some real treasures and some real junk … and each run of the said tool will differ in quality. So, if you get a good one praise I,t but be aware that next months shipment may not be the same. And I will say, as I hang my head like a Yugo owner, I own some HF tools and actually use some of them … once in a while. Being a HF customer for many years, I have seen good, bad and really bad tools. Their one redeeming quality being their return/refund policy. I have heard people swear at their tools and others have praised them. Recently, I have noticed a gradual improvement in quality. I do believe HF is striving to be more competitive with the name brand tools from Skil, B&D and others. I have noticed some tools that were formerly made in China, now are made in Taiwan. That has to be a positive step in quality. Power tools is one area where there needs to be improvement. I have always regarded their light machines as projects in progress. A little tweaking here and there, filing and better fasteners can turn a piece of junk into an acceptable machine. I too, MrRon, have seen improvement in HF tools. I think China is making progress in that direction on its own. The same thing happened to Japan in the 1970s and 1980. Buying at Harbor Freight needs a critical and experienced eye for quality. You can generally get a pretty good feel of the quality by close examination of the finish and sturdiness of construction and knowing how things should be properly designed and made.